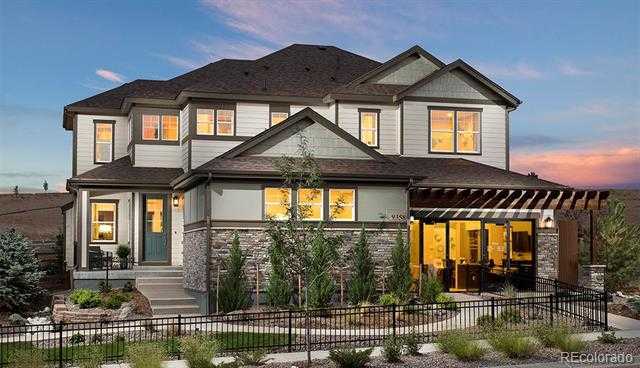 Builder's gorgeous move-in ready model home. Professionally designed and includes all window coverings/draperies. This home is located on a xD; xA;beautifully landscaped homesite, backing to a greenbelt. Open kitchen with contemporary cabinetry and stainless steel Whirlpool kitchen appliances. Other special features include fireplace, hand trowel texture, steel tube stair railing, laundry cabinets, designer lighting throughout, extensive low voltage wiring and covered patio. Builder will convert the current sales center back into a 3-car garage and install driveway, some front yard landscaping will be altered, otherwise home is sold as is. Closing/move-in should be planned for April/May. Located in desirable Candelas community, new K-8 school (K-7 2018/2019), two rec centers with outdoor pools, exercise rooms, party rooms, parks and trails. HOA is a metro district and fees are incorporated into the property taxes. Check out the full 3D virtual tour to see everything this home has to offer. Please, send me more information on this property: MLS# 5027280 – $729,900 – 9358 Yucca Way, Arvada, CO 80007.